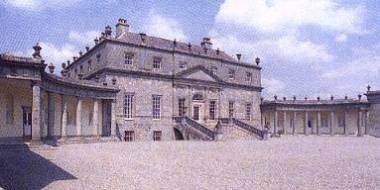 Russborough House in Blessington, is situated near the borders of counties Kildare and Wicklow. Nestled in spectacular natural surrounding, there is no other Palladian house in Ireland to rival it aesthetically or architecturally. It was designed by the renowned German architect, Richard Cassels. It has been perfectly preserved, with all original features still intact. It was built in 1741 by Joseph Leeson, first Earl of Milltown. The architect was the German, Richard Castle (Cassells). The house is built of granite from a nearby quarry and is in the Palladian style with a central block with colonnades and two wings. The front façade of the house has a fine flight of steps, with heraldic lions and urns, a sweep of graceful curved colonnades crowned on the skyline with boroque urns, and well-proportioned, solid flanking wings. Important features in the house include stucco ceilings by the Lafranchini brothers, mantelpieces, inlaid floors and lavish use of San Domingo mahogany in doors, dados and staircase. Following the death of the last Earl of Milltown, the Milltown Collection was presented to the National Gallery of Ireland. Sir Alfred Beit bought Russborough in 1952 as a home for the Beit Collection. In 1976 he established the Alfred Beit Foundation and in 1978 the house was opened to the public. The house is beautifully maintained and contains fine furniture, tapestries, carpets, porcelain, silver and bronzes. By prior arrangement guided tours are available on any day at any time. Catering available.